SPARROW MEETS THE DRAGON AGAIN!! is a priceless collection of classic Calypsos and ballads from the original 1975 REUNION release by Byron Lee and the Dragonaires and the Mighty Sparrow. Classics include a remake of 'Obeah Wedding', 'No Kinda Man at all' and 'Dragon Dance' Mighty Sparrow and Byron Lee's 'Again' is among the first round of the new Reggae Rewind series by VP Records which highlights classic releases from days gone. 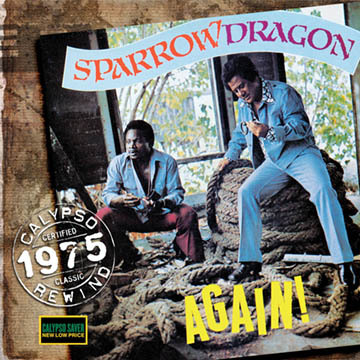 This 1975 reunion of Mighty Sparrow and Byron Lee dubbed 'Sparrow Dragon' takes a winning formula forward into the era of rock and early disco. 'Again' consists of Calypso hits 'Dragon Dance', 'No Kinda Man At All' and 'Obeah Wedding(Melda)' plus the unlikely counterparts 'If' (made famous by the rock band Bread) as well as a solid remake of the gound breaking disco hit '(Do) The Hustle'.